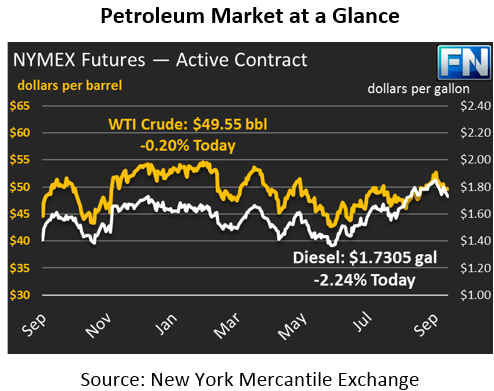 Oil markets experienced strong losses on Friday, and continue to show weakness today. Crude prices plummeted on Friday, losing nearly $1.50, or nearly 3%, during trading hours. Prices weakened as the fear of Hurricane Nate turned to apathy; while production was shut in during the storm, expected damages were minimal. Prices are $49.55 currently, up from yesterday’s closing price but well below the $50-$51 level seen in recent weeks. Refined product saw significant declines on Friday as well, propelled by falling crude oil rates. Diesel prices gave up roughly five cents, or 2.8%, on Friday, and have lost another 1.3 cents this morning to reach $1.7305. Refined products have been driven by large fluctuations in crude prices recently, rather than major fundamental changes for the product itself. Gas prices are also down 1.25 cents (.8%) this morning to $1.5463. Gasoline fell a whopping 6 cents, or nearly 4%, on Friday, propelled by weak demand and falling crude prices. News today has been relatively light, focused on operational restarts in the Gulf following Hurricane Nate’s landfall. So far, no major damage has been reported, though 1.5 million barrels per day of production were offline as of yesterday as a precautionary measure. Refineries in the area have indicated no impact on production following the storm. Over the weekend, OPEC’s Secretary General Mohammed Barkindo noted that a rebalancing of oil markets is in progress, but would require “extraordinary measures” to return to historical supply levels. Markets are now questioning– what extraordinary measures does he have in mind? Are existing measures not enough to balance markets and send prices higher? It was a confusing remark that markets have interpreted as bearish news, sending markets lower still. On the flip side, Saudi Arabia and Russia appear to be building a new relationship to help boost oil prices, with both countries apparently willing to continue production cuts through 2018.